A very rare bullion officers cap badge for the Infantry School Corps (1883-1892). With the same variety found in every human endeavour, collectors of badges and other militaria bring a wide array of interests, intents and motivations to their hobby. Some build collections "a mile wide and an inch deep" while others dedicate themselves to finding every possible item in a very narrow scope. Regimental collectors, those who collect to a single regiment across the span of its history, would fall into that latter category. And among that group I would count myself. Many military badge collectors focus on a single period in history as a theme for their acquisitions. Whether it be the badges of the Canadian Expeditionary Force in the Great War, or the Canadian Active Service Force of the Second World War, or a period of the Canadian Militia, they seek examples of the badges for each of the units that existed during their chosen time frame. Others might collect in a more narrow scope, perhaps building representative badge groups for a specific brigade or division. But each of these groups often stop looking for the badges of a unit once they have examples for their collection. Although exceptions will always be found, they do not overly concern themselves with variations of each badge. But the regimental collector is a different sort of creature. The regimental collector attempts to track down an example of each and every badge worn by his or her chosen regiment. Following changes in design, materials, construction sometimes differences so minor in scope that they are easily missed by the casual observer. Each addition to such a collection adds one more link in a chain of history from the regiment's creation to the current day. In continuing my theme of writing about the badges of The Royal Canadian Regiment, this article will explore and examine some of the rare and unusual badges of The RCR that have come to my attention, and to my collection. Every collector has to deal with the "holy grails." Those badges so rare that a collector can wait years or decades for one to appear. So rare that one can feel like a vulture waiting for the more senior custodians of his desires to pass on so their rare badges become available to the next generation. Sometimes such grails are only known through photos, or sketches in obscure references, or in whispered exchanges over tables at trade shows. But the collector seeks them all the same, envisioning the "gaps" in his collection as holes that need to be filled with the missing badges. Occasionally, something even more special than finding a known and avidly sought after grail occurs. And that is when a badge comes along that is so rare, so unknown to collectors, that it has not even been considered available. 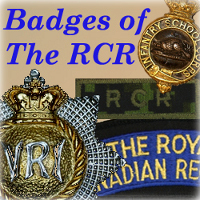 Such a badge for The RCR has recently resurfaced. In late 2008, an online auction featured such a badge, one so rare that its veracity could not be doubted for who would copy a literally unknown artifact. That badge, after successful bidding, came into my collection. The RCR existed for a few brief years as the "Infantry School Corps" from 1883 until 1992, when the regimental name was changed to the "Canadian Regiment of Infantry." Badges were named to the "Infantry School Corps" with the Canadian designation shown by a beaver as the central figure. Metal badges are known for cap, helmet and collars, but they are not common among collectors or museums. The officers of the Regiment during the I.S.C. period also had a bullion wire badge, with a brass and silver centre piece. To give an idea of how rare these might be today, in the nine years of the Infantry School Corps, the regimental history lists only 36 officers who joined the Regiment. The few badges that might have been made for them, coupled with the recognized fragility of the wire badges, assures that the survival of any of these badges is a remarkable event. And yet one has survived. More amazing still, it is accompanied by a matching set of collar badges, also of bullion wire and brass. Rare, possibly the only surviving examples, it has been confirmed that these badges were for years in a museum collection in California. That collection was broken up after the owner died and his heirs sought to liquidate his assets. From there the badges traveled as part of a larger auction lot to Australia, to a dealer who had acquired them with the intent of reselling the items in smaller lots. Thanks to the wonders of the internet which have opened up worldwide markets to collectors, these unique badges have now traveled back to Canada, and back to London, Ontario, where perhaps they once began their regimental life. The bullion Infantry School Corps badges have joined my growing collection of regimental badges. An unexpected acquisition, but warmly welcomed, they fill a gap I didn't know I had. Maybe the grails I still seek will arrive soon to join them. Tanged cast bronze Officer Service Dress cap badge, early 1900s. Modern metal cap badges are produced with a "slider" which is used to attach the badge to a beret or other headdress. Those regimental badges produced for wear on the Wolseley helmet have a single screw post fastener, which is an unusual modern contrivance, historic "pugaree badges" had a broach pin fastener so that the pugaree and helmet would not need to be holed to mount them.. The most common fastener on earlier badges on earlier badges were metal "lugs" which pierced cap or uniform material and were then used to hold the badge in place by use of a brass cotter pin inserted through the loops of the lugs. But some early regimental badges used another type of fastener. Commonly referred to as "tangs", these were pointed metal tabs which were designed to pierce the cap material and then simply be bent over on the inside to hold the badge in place. Badges with tangs are relatively uncommon, and it is likely that the action of bending the tangs back and forth could lead to eventual breakage and the badge's disposal, thus ensuring a low survival rate. Among RCR badges, some tanged examples of the 1894 Guelphic crown pattern badges can be found. The rarity of these badges and the single badge pattern they appear on make it likely that this type of fastener was only used on certain badges before, or perhaps as late as during, the First World War. For a brief period in the early 1900s, officers of the Canadian Army were authorized the wear of brown badges on the caps worn with Officers' Service Dress. Although described in the 1907 Militia Dress Regulations as "bronze" badges, brown badge variations can be found that were obviously not cast from that metal. Cast bronze badges can be found that are very high quality in detail and finish. But these were obviously not readily available to every officer who needed to appear properly dressed. An alternative type of badge, also giving the desired "brown" effect also exists. These expedient badges were a common version of the two-piece regimental badge which was coloured brown to give the required look for Service Dress. Left: Finely cast, two-piece, bronze Officer Service Dress cap badge, early 1900s. Right: Two-piece, brown coloured Officers' Service Dress cap badge, early 1900s. One-piece gilt Guelphic crown cap badge. In many regiments there have historically been distinctions made between officers' badges and those worn by NCOs and soldiers. The two most common methods to distinguish officers' badges have been the use of gilt and the use of silver overlays of parts of the badge design. RCR badges have seen the use of both of these methods, both separately and used together. 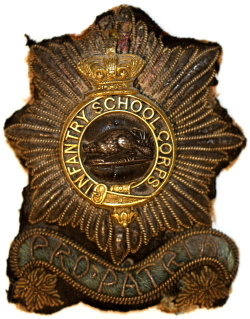 The earliest use of gilt badges can be fund in those made for the Infantry School Corps (1882-1892). These include the 1883 helmet plate which was identical to the soldier's helmet plate except for a gilded finish over the brass, and the gilt version of the glengarry cap badge. While the regimental museum displays two more ornate helmet plate versions which are identified for wear by officers, no documents confirming approval of these patterns has yet been brought forward for their use during the Infantry School Corps period. During the period of the Infantry School Corps, it was quite clear that the officers wore gilt badges and the NCOs and soldier wore brass. 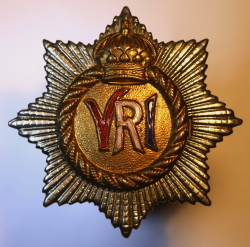 But in later versions of regimental badges, officers badges might be gilded or not, and usually but not always included a silver overlay of the "VRI" cypher. We've already noted above the brown Officers' Service Dress badges, these were notable for officers' badges in that they were neither gilded, nor did they have silver overlays. 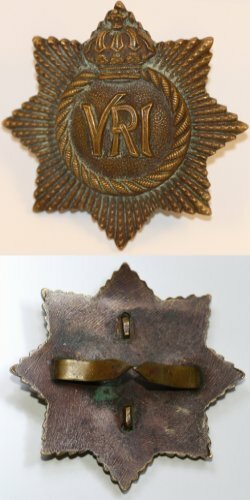 Another version of the 1894 pattern badge exists that was gilded, but notably did not include the silver "VRI" for officers. Made of a single stamped piece of brass, these badges are notable for their one piece construction. Of this pattern, the gilt finished versions are probably the most rare. Three-piece version of the Guelphic and St Edward's crown badges can be found, both patterns having a gilt front-piece surmounted by the "VRI" cypher in silver. 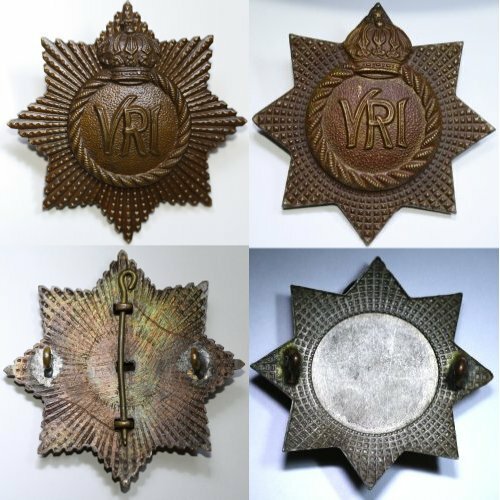 While officers' badges with the the silver VRI are more common in both patterns, the gilt versions are quite rare in both cases. Left: Silver and gilt three-piece officers Guelphic crown cap badge. Right: Silver and gilt three-piece officers St. Edward's crown cap badge. Guelphic crown cap badge with enameled "VRI" in red, white and blue. Every once in a while, a version of the regimental cap badge appears that has stymied collectors. With no regimental records having been found to explain their existence, we can only conjecture why there are a handful of badges in existence with the "VRI" cypher enameled in red, white and blue. A possible explanation is that these badges were prepared for Victoria's Diamond Jubilee in 1897, Her Majesty's funeral in 1901 or Edward VII's Coronation in 1902. The regimental history does not mention regimental contingents attending the first two of these events, but there was regimental representation in the Canadian contingent at Edward VII's coronation. One other alternative explanation is that they may have been prepared for a Royal visit to Canada during the same era. One thing is certain; this experiment in coloured enamel on the regimental cap badge was short-lived and never repeated. Each of these badges is of the 1894 Guelphic crown pattern, but not every enameled badge is of the same badge production run. It is apparent that this enameling, while professionally done, was not a set of badges ordered together, but must have been a separate contract to have available badges enameled for a specific purpose or event. These badges also have a variety of fasteners, with both lugs and puggaree brooch pins being noted. Sand cast, one-piece Guelphic crown cap badge. This particular badge is likely the result of a member of the regiment needing a replacement at a time when access to the normal supply of regimental badges is not available. Perhaps having local access to a variety of craftsmen, it was necessary to have a replacement made and the readily available technology to do so was sand casting. This cast badge is a single piece construction, with heavy lugs fixed to is flat back. The surface shows a distinct roughness and small voids under magnification that give evidence to its mode of manufacture. The maker used a file to smooth the back and to do his best to replicate the many small points of the start pattern around the badges' edge. This latter step was not done as well as might be hoped for but the overall look of the badge is acceptable. Close examination does show that the original used for the casting process as a model for this badge was definitely an officers' pattern badge with silver overlay VRI. The height of the letters matches those officers badges and are too high to for it to have been a soldiers' badge used as the model. It is possible that this sand-cast badge is either a locally produced Officers' Service Dress badge, or possibly a low contrast badge produced for wear in the field during the First World War. Unfortunately, without a dependable provenance, we can only speculate. This article about regimental badges is an excellent opportunity to document one other badge of much more recent manufacture than those described above. Considering that some of the opinions offered above are due to the absence of recorded details about individual badges, this note will provide such details for this example. In 2006, the Kit Shop of the 1st Battalion decided to deal directly with a badge manufacturer rather than continue obtaining its supply of badges direct from the Regimental Store. As the Regimental Adjutant, I had occasion to visit the 1RCR Kit Shop shortly after they had received samples. One of the sample badges was placed in my hand and I immediately identified a problem with the badge - it was undersized. In response to doubtful utterances at the proclamation of the badge's shortcoming, a ruler was sought and produced. As predicted, the badge measured only 1 7/8 inches from point to point, instead of the required two inches. Forage Cap Badge: A silver eight-pointed star, with a raised gilt circle same as for centre of the helmet plate, but in proportion, the Royal and Imperial cypher (V.R.I.) in frosted gilt, surmounted by the Imperial Crown, dimensions of the star, 2 inches. Helmet Plate: In gilt metal, a star. On the star a laurel wreath. Within the wreath, the Royal and Imperial cypher (V.R.I.) in relief on pebbled ground and raised border surmounted by the Imperial Crown. At no time has the size of the cap badge, two inches, ever been changed. Having handled hundreds of regimental badges spanning the years from 1894 to the present day, that 2-inch measurement has been consistent to a degree that many outsiders would attribute directly to aRoyal Canadian attention to detail (though perhaps not with such a polite phrasing). The role of the Regimental Headquarters in authorizing the production of regimental accoutrements was reinforced, and the manufacturer was required to produce new samples before they could be approved by RHQ for wear. It is hoped that the only undersized badges produced were those few samples. In case others exist, they can now be clearly identified as both undersized and as an unauthorized version of the regimental badge. The many variations of the regimental cap badge make collecting them an adventure in itself. We each become very familiar with the badges we have been issued, and every day we see them worn by the serving members of the regiment around us. Common regimental lore tells us The RCR has worn the "VRI" throughout its history, and we can easily become comfortable thinking that our badges have changed very little in over a century. But changes have occurred, leaving The RCR with a rich array of badges. Investigations into the evolution of our regimental badges opens paths into the history of our Regiment and leads to many other facets of a rich historical tapestry woven by generations of Royal Canadians before us.